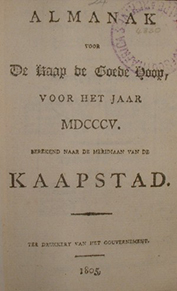 The Cape of Good Hope was under Batavian rule in 1805 and this directory and almanac represents those holding office between the two British Occupations of the Cape. It includes details of office bearers for Cape Town, Graaff-Reinet, Stellenbosch, Tulbagh, Uitenhage and Swellendam. Office bearers include Landrost and Heemraden, Veld-Cornets, Clergy, Judiciary and Military Officers as well as Gewapende Burgermacht. There is also a section which deals with those commissioned to improve farming and agriculture.